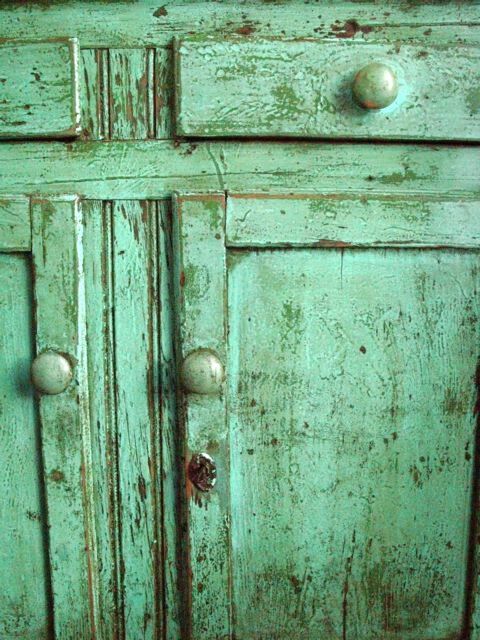 I've gotten a lot of questions and comments about the two Mexican antiques I have in the house (green cabinet pictured here in the old dining room). Rene from the wonderful blog Cottage and Vine asked me if I could pick a color that was close to this green cabinet because she might like to paint something this color, the perfect "farmhouse green" she thought. The difficulty is, as you can see, there's not just one color. 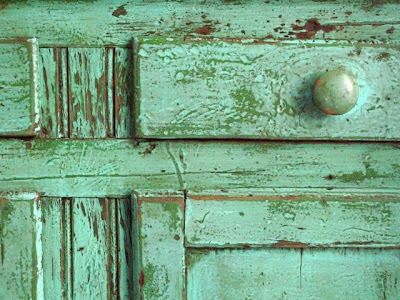 There are at least three different paint colors in addition to the wood, along with their respective variations from years of use and abuse, that all go in to the mix. The thing that makes the surface so exciting, in my opinion, is an alternation of a warm green (one that's more yellow than blue) and a cool green (more blue than yellow) that create an almost electric vibration of color. 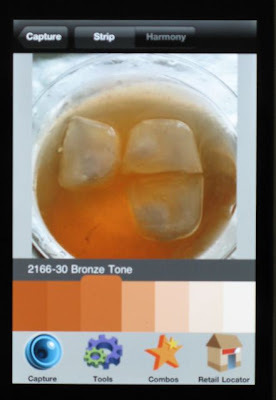 I don't have an iPhone so I invited some friends over for Labor Day cocktails and Indian takeout knowing that a few of them had iPhones and I'd just ask them to download the Benjamin Moore Color Capture app and give it a test. Sneaky, right? We removed a drawer and took it outside so we could get a good close up photo captured the photo in the app. Here are the results. 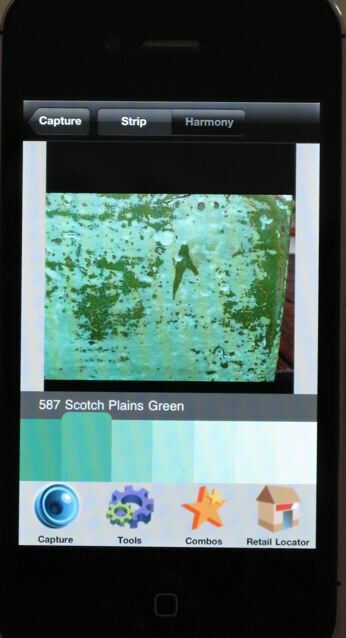 Even though there are several colors here, the app allows you to touch the screen to pinpoint an exact spot on the photo where you want the app to interpret the color. Unfortunately the little bubble disappears when you take your finger off the screen. It would be nice if that stayed on the screen. 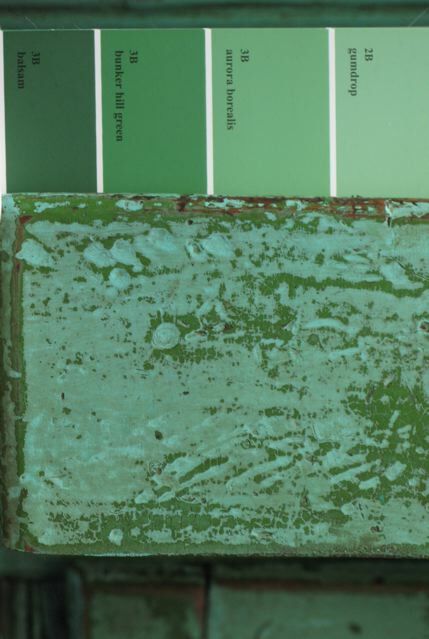 The cooler green came out as Scotch Plains Green, BM 587. And finally, there are a few areas of a color that are even more blue (immediately to the right of the knob) that came out as Summer Basket Green or BM 2040-40. This color rang a bell. 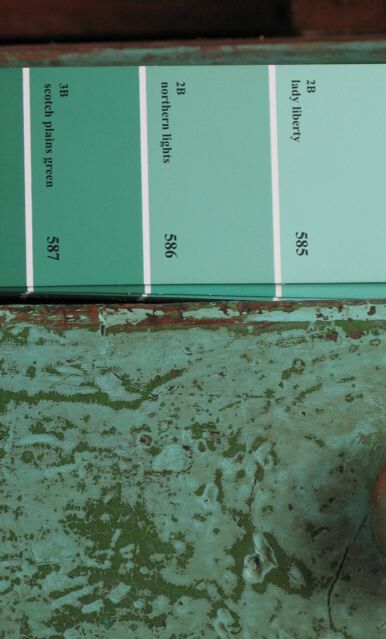 I remember someone using this color for a painting project. I suspected it was Lori from Frugal Farmhouse Design so I did a google search for "frugal farmhouse summer basket green" and I was right. 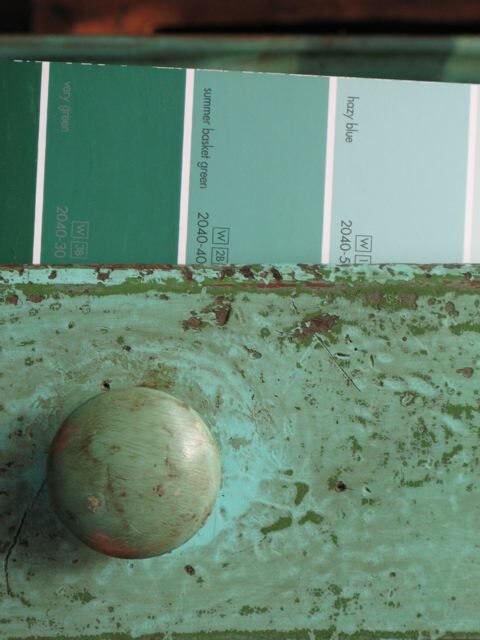 Here's Lori's post of a table painted using this color. So let's put the app to the test by comparing the colors it chose to the actual piece. 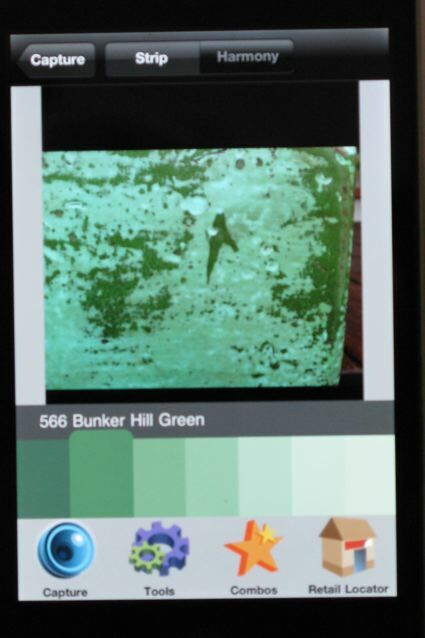 Here's Bunker Hill Green which was the app's choice for the warm green. Scotch Plains Green. This one seems off. Too saturated. Northern Lights looks a little better. 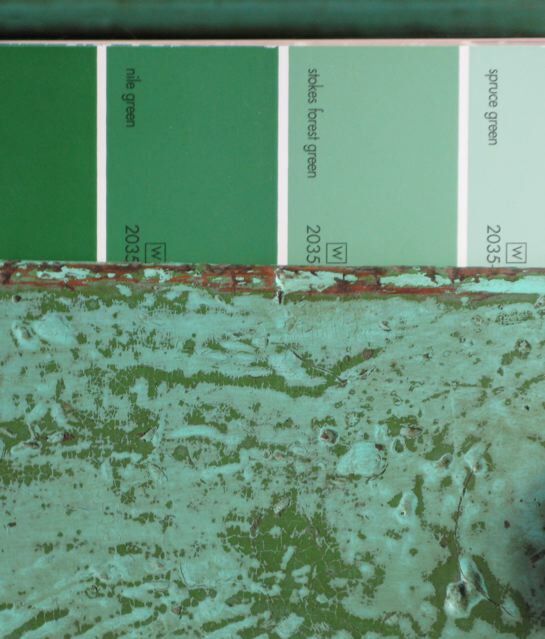 A color capture of the green console in the kitchen came out as Green With Envy, 2036-30. In the end, I'm quite impressed with the Benjamin Moore Color Capture application. It's not something you would use every day but I do recall being out in a store, for example, and seeing a great color on a wall or on a piece of furniture and wishing I knew what it was. 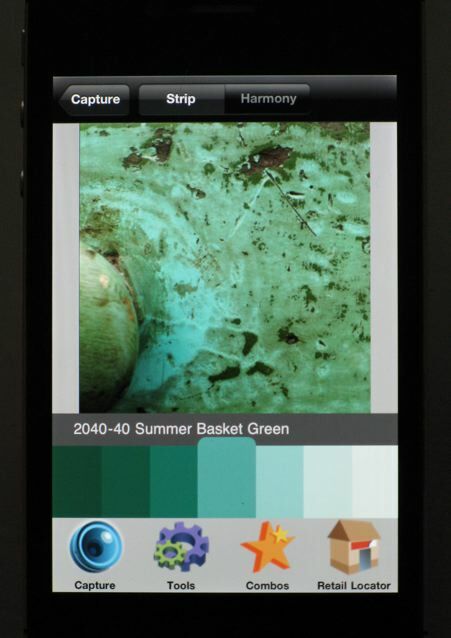 This free app is the perfect way to capture the moment...and the color. 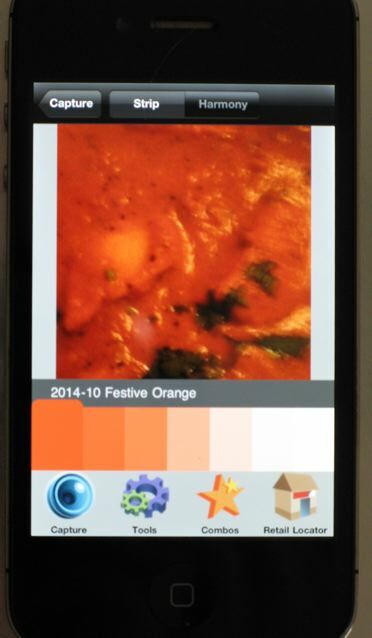 Chicken Tikka Masala is Festive Orange. 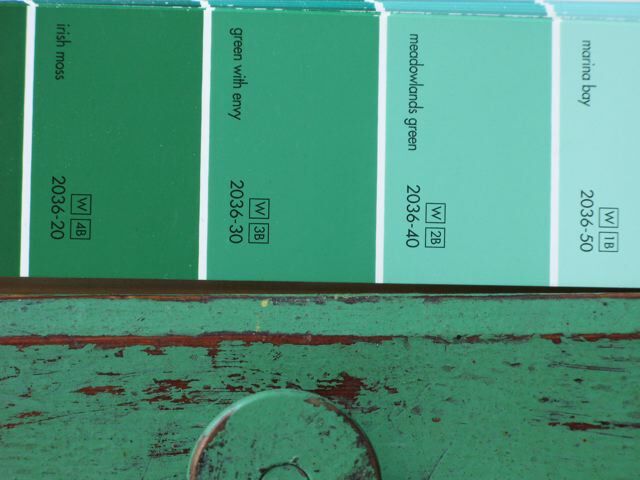 Benjamin Moore 2014-10. And it should NEVER be operated under the influence of alcohol. Bergamot Martini. Benjamin Moore Bronze Tone, 2166-30. OMG! I HAVE to get this...lol. I too, thought the color capture device was a lot pricey...this is so much better! Thanks for the heads up! this is so cool. i need to borrow one or someone that has one. thanks steve. I don't have an iPhone either. I think the app would be fun to putz around with but more importantly what is a bergamot martini. I know what bergamot is but in what form does it enter the martini. I guess I just want the recipe. It sounds so gloriously good. It was an experiment of mine. I made simple syrup using three Earl Gray teabags to one cop of water and one cup of sugar. The drink about two parts vodka, one part cointreau, two parts lemon juice and two parts Earl Gray syrup, and a few dashes of bitters. That's guess. I was experimenting so it was a little of this, a little of that. Wow. What a great gadget. Imagine the possibilities out and about wandering the stores. You can find bergamot essentil oil very inexpensively at Bolek Craft Supply in Dover, Ohio. They are very high quality. The cheapest I have seen! I buy their lavender a dozen bottles at a time! 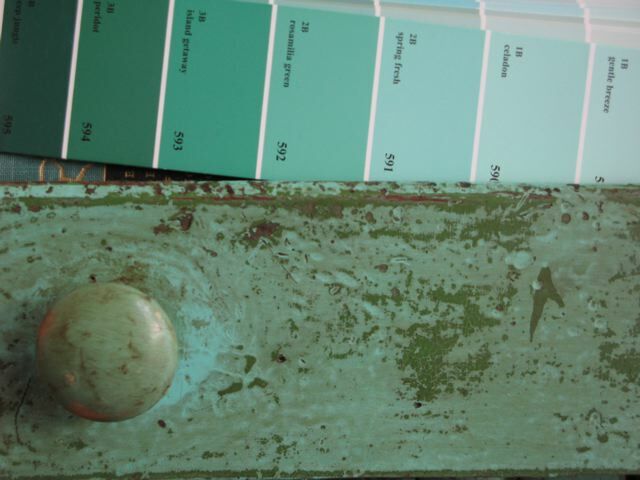 I really want to paint my dining room the colors of a mourning dove. How hard would it be to get one close enough to the application, I wonder? That is so neat! I wonder if I need an I phone just for that app. Thank you for pointing out the Ben Moore problem in Canada. I just don't understand why they have to be different. I wish I were at that party. A bergamot martini sounds divine. I love all the greens your app picked...! Finally, one good reason to get a smart phone. Your martini/Palmerini sounds pretty swish. haha obsessed with your post! too funny! gotta try it out! Just another reason why I need an iphone. I have not gotten one because I'm loyal to Tmobile and they don't offer them. Very hard for me to do without as I am a Apple Computer fanatic. This app looks so addictive...oh..how I would love to have. I think that Arnold Palmertini looks delightful. I've been drinking Arnold Palmers a lot this summer. I never had had one till a few months ago...and was like "Look what I've been missing!" Have I told you lately that I love your blog? I do...I really do. I love those green mexican pieces you have too. We have a store here called El Paso Imports and they sell old Mexican furniture and antiques imported from other countries too. 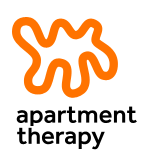 I have a friend that just about buys all her furniture there. Her big huge bed made from Indian columns and doors is to die for. Its so massive and she is very very little. Ok...clearly it has been a long hard day...because after the *labor* cocktail...My mind couldn't handle anything else you said. Labor coctail? what is that? The app looks fun...even more fun with a bergamot martini under your belt. And a bergamot martini? Just WHAT experiments do you do in that Ralph Lauren-esque closet bar of yours anyways?! ...Was touched by your 9/11 comment. Wish I had that app. I'd color code my critters so that their hair would "blend" in. That is the coolest! I need that app but I have a droid. Will have to snag aq friend's Iphone. Very entertaining post. Thanks for sharing! Aaaahhhhh!!!!!! I have to go put this on my phone right NOW! How could I have not know about this? I am indebted, Steve. What a cool tool. Oh, and I'll take that drink while I download that app. thanks! Coolest color post by anyone - evarrr! I have the app. It "kinda" works. Too bad you can't take a picture of food and it gives you all of the ingredients. Now that would be an app! After a few martinis I would be a nuisance with that app...:) and you would be asking me gently to leave. So very cool. I have walked all through my house getting color samples. Last night we used the "level" app on my husband's phone to accurately measure our grandson making one more mark on his growth cart on the molding surrounding our kitchen door. I will ask him to pleeeez download the Ben Moore app.That will be sooo much fun. Thank you, Steve. I enjoyed your party! oh, i've wondered if i should get that app - now i will! 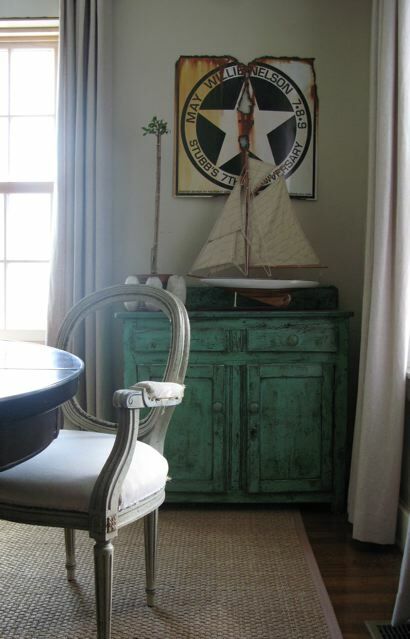 and you know how i love to see that cabinet featured in posts (or sneaking out from around a corner). 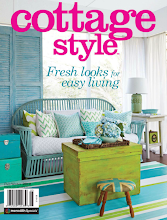 I sell Benjamin Moore paint in Canada, have for over thirty years. Just a small correction for your fans here - you can get the 3 and 4 digit colours here. The dealer might not have a set of chips to show you, and definitely won't have a large display of them, but they'll be able to make the colours, no problem. A lot of them were actually carried forward into the current system and renumbered, so you can get samples for those. Just ask for them by number, and explain that you got the colours online, or from an American source. It is a killer app, isn't it? Thank you, Colin, for that correction! It's so fun to see this work. I have the app downloaded on my phone but haven't used it yet. Looks like it's a winner. Thanks for testing it for us. Hey I have been busy at Brimfield, but when i saw the title I had to see what you thought...and then I noticed you were talking to ME!! so fun! Anyway I think it is good in a pinch, and it is just fun using this kind of technology...I love those green colors. 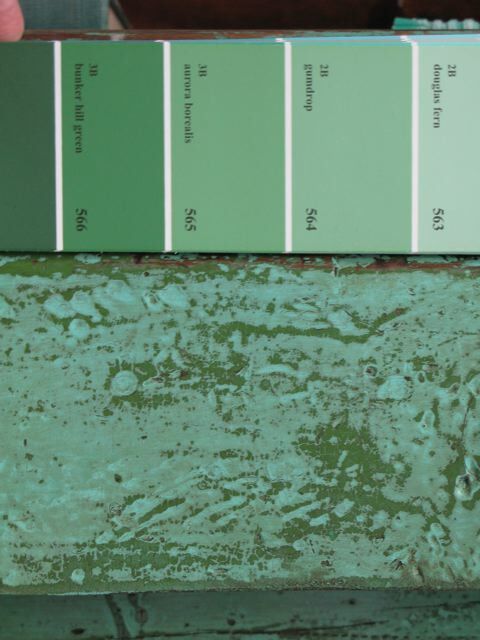 don't you just love the name Bunker HIll green? Little did Rene know what she was asking!! I bet she is very appreciative. I had no idea about the app. Now I need an iphone. Wow how fun and cool is that app!! I love your chest by the way! Come and join my Giveaway from the Jose Estevez Collection at Interieurs! Sometimes you just gotta love love technology, don't you? ! Brilliant. Though not brilliant enough to make me get an iphone. I do love green and have used a couple of those greens you found. Great pos! 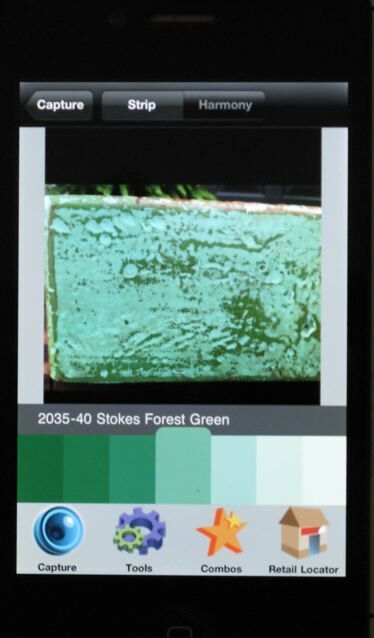 I used this app when I painted my house and wanted a brown that would blend with the foundation stones. If you aren't good with colors, and I'm not, it really helps you get in the same color family.